• Cassini Maps make Ideal Gifts for all the family. • Order now! Last chance before for Christmas! • Simply use the code C-XMAS17 when prompted during checkout to receive your 10% discount. Postage and package applies as normal. Visit www.cassinimaps.co.uk now and see which maps we have available for your area. Buy them for yourself or make a present of the past to someone in your life. November Sale – 20% OFF! Diverting, decorative and practical presents for anyone with any interest in the past. Personalised maps centred on the location of your choice. • For your friends or relatives or even for yourself! Use coupon code C-Nov17. Simply enter the code when prompted during checkout. When is a railway not a railway? The Surrey Iron Railway (SIR) was first public railway independent of a canal to be built by Act of Parliament (1801). Although private railways were already in operation around Britain these were used exclusively by the owners of mines and quarries for moving their own goods. The SIR was different, it levied Tolls allowing independent goods hauliers to use their own wagons (with wheels at a suitable distance apart) pulled by horses. The Surrey Iron Railway is famous for being the first company in the world to include the word “railway” in it’s title. Despite this it was not what we today would recognise as a railway. It was actually a plateway, where vehicles with plain wheels ran along flanged rails. The track comprised iron L-section rails 4ft 2in (1.27m) apart secured onto stone blocks. The trucks were horse-drawn, typically 8ft x 4ft x 2ft deep and weighing about 1 tonne. They could carry 3 tonnes of coal, lime or grain. One horse could pull up to ten wagons but the usual number was about four. The original plan for a transport connection between Wandsworth, on the River Thames, and the Wandle Valley had been for a canal, but doubts about the availability of water led to the adoption of a plateway. The railway was only briefly successful financially. It lost much traffic after the Croydon Canal opened in 1809 and continued to decline as steam railways took hold. The advent of faster and more powerful steam locomotives spelled the end for horse-drawn railways. In 1823, William James, a shareholder in the railway, tried to persuade George Stephenson to supply a locomotive. Stephenson realised that the cast-iron plateway could not support the weight of a locomotive and declined and railway was finally closed to traffic on 31st August 1846. Shakespeare’s Birthplace is a 16th-century half-timbered house situated in Henley Street, Stratford-upon-Avon, Warwickshire, where it is believed that William Shakespeare was born in 1564 and spent his childhood years. Shakespeare is also known to have spent the first five years of married life in this house with his new wife, Anne Hathaway. The house itself is relatively simple, but for the late 16th century it would have been considered quite a substantial dwelling. John Shakespeare, William’s father, was a glove maker and wool dealer, and the house was originally divided in two parts to allow him to carry out his business from the same premises. The building is typical of the times and was constructed in wattle and daub around a wooden frame. Local oak from the Forest of Arden and blue-grey stone from Wilmcote were used in its construction, while the large fireplaces were made from an unusual combination of early brick and stone, and the ground-floor level has stone-flagged floors. The plan of the building was originally a simple rectangle. From north-west to south-east, the ground-floor consisted of a parlour with fireplace, an adjoining hall with a large open hearth, a cross passage, and finally a room which probably served as John Shakespeare’s workshop. A separate single-bay house, now known as Joan Hart’s Cottage, was later built onto the north-west end of the house, and the present kitchen was added at the rear with a chamber above it. The ownership of the premises passed to William on John Shakespeare’s death. William already owned his own property in Stratford and had no need for the Henley Street premises as a home for himself or his family. Consequently, the main house was leased to Lewis Hiccox, who converted it into an inn known as the Maidenhead (later the Swan and Maidenhead Inn). Under the terms of Shakespeare’s will, the ownership of the whole property (the inn and Joan Hart’s cottage) passed to his elder daughter, Susanna, upon his death. In 1649 it passed to her only child, Elizabeth, and then in 1670 to Thomas Hart. Hart was the descendant of Shakespeare’s sister, Joan, whose family had continued as tenants of the smaller house after her death in 1646. The entire property remained in the ownership of the Harts until 1806. Maps, Mudge and the Census! The history of the Ordnance Survey’s mapping began in 1791 when the government, fearful of the threat of an invasion by French revolutionary forces, instructed the then Board of Ordnance to make a detailed survey of the vulnerable southern regions of England. At the beginning of the nineteenth century some maps at the one-inch (1:63,360) scale based on Board of Ordnance surveys were already available to the public, including Kent (1801 – the ‘Mudge map’). The first published by the Ordnance Survey itself was the map of Essex which appeared in 1805. This was the start of a nationally (England & Wales) numbered map series, which later became known as the ‘Old Series’. 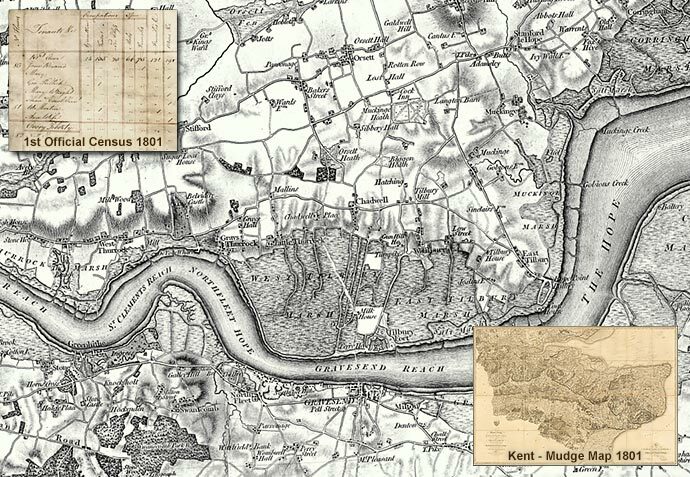 On the 10th March 1801, the same year as the ‘Mudge Map’ of Kent was published, the first official census was held in Britain. Objections were raised as some felt that the census was aimed at extracting revenue. Others feared that in the era of the Napoleonic Wars the information would inevitably see its way into the hands of the enemy, allowing Bonaparte to plan an invasion of the British Isles. By 1800 the need for a census had become greater than the resistance to it. Talk of population growth outstripping the ability of the country to feed that population was a forceful argument in favour of compiling the statistics. Thus the Census Act of 1800 was passed on 3rd December 1800, receiving royal assent on the 31st December and the census was carried out on Monday March 10th 1801. Estimates of the size of the population varied from 8 million to 11 million. The actual figures proved to be: 8.3 million people in England – women outnumbering men by 300,000; the Welsh population was 542,000; and Scotland 1.6 million. Thus the total population at the beginning of the 19th century was officially recorded as 10.4 million. Moreton. More to Chew on! Chew Valley Lake is a large reservoir in the Chew Valley, Somerset, England, and the fifth-largest artificial lake in the United Kingdom, with an area of 1,200 acres (4.9 km²). The lake, created in the early 1950s and opened by Queen Elizabeth II in 1956, provides much of the drinking water for the city of Bristol and surrounding area. Under the waters of Chew Lake lies the small hamlet of Moreton. It was mentioned in the Domesday Book and, at the time of its drowning, included a mediaeval chapel, a moated house and a mill. Roman buildings and flints were also found on the site. Before the lake was created, archaeological investigations were carried out that showed evidence of occupation since Neolithic times and finds of Roman artefacts. Excavations found evidence of a thriving community in medieval times and what is reportedly the remains of the Nunnery of Santa Cruz. Moreton was also the site of gunpowder mill in the 18th century. Prior to the flooding of the reservoir excavations of the surrounding area were carried out. The excavations found evidence of habitation dating from the Old, Middle and New Stone Age, Bronze Age and Iron Age. Evidence included implements such as stone knives, flint blades and the head of a mace, along with buildings and graves. What evidence is left of the area of Moreton today? The historical maps are now the only way to view the details of the landscape and understand the generations of occupation of Chew Valley.